The pretty village of Bundeena on the Cronulla Coast surrounded by the Royal National Park in Southern Sydney, is the location of Bundeena Markets. 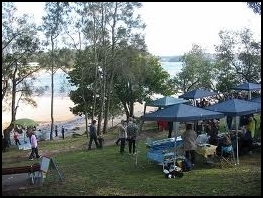 There are many weekend markets in and around Sydney, but Bundeena must surely be amongst the most picturesque. This area of secluded bays, beaches, and bushland is home to many artisans whose unique products showcase their love of nature and their surroundings. 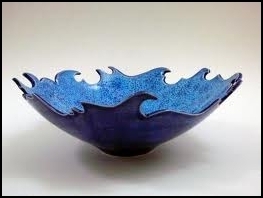 You can pick up some beautiful hand made ceramics and jewellery. Tea sets, vases, coffee cups, home made soaps and gorgeous hand crafted plates. 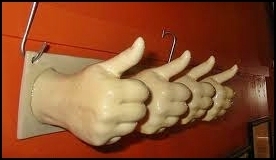 It never ceases to amaze me how creative these artists can be. The markets also showcase photography, folk art, plants, clothes and books. I must admit I am a sucker for home made pickles and preserves, mustards and infused cooking oils. 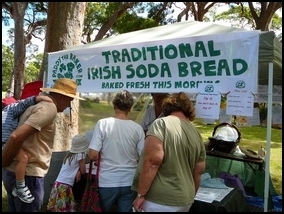 Bundeena Markets is abundant with home made pantry items. And if you fancy a bite there are plenty of fresh food stalls. There's fresh baked bread, locally made cheeses, turkish gozlemes as well as hot roasted nuts. If you happen to be an entertainer, Bundeena Markets are always on the lookout for performers to busk. You can apply here. Getting there: From Cronulla Wharf take a scenic ferry ride across the water to this lovely hamlet in the Hacking. If coming by car enjoy the wonderful drive through the Royal National Park. 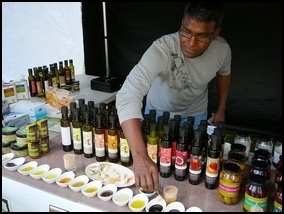 Markets are held on the first Sunday of every month from 9am to 2pm at Horderns Reserve next to the Bundeena Ferry Wharf. If it happens to be raining, the event will be held at Bundeena Public School. After the markets, you may like to explore Bundeena further by taking a stroll along the adjoining Horderns Beach or for the more adventurous enjoy a bush walk in the stunning Royal National Park. We went and there were only 12 stalls. Great weather and we were there at 10:30am, so they should have been set up. It was an hour long drive and $11 entry fee to the national park for 12 stalls. Don't bother.